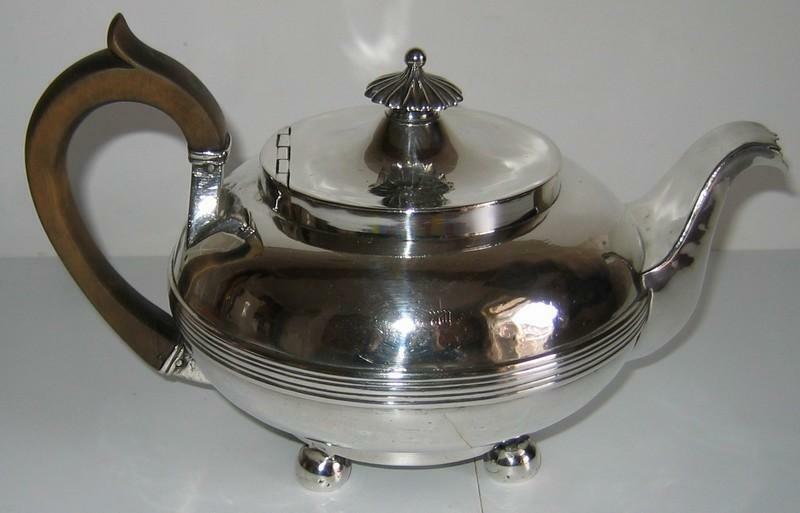 This teapot was made in Calcutta (India) by Hamilton & Company, which was established by Robert Hamilton and others at the beginning of XIX century. 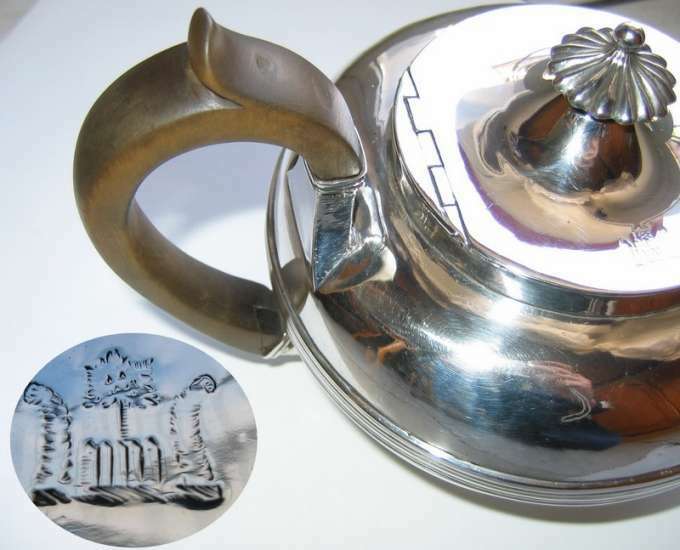 Due to the fact that the British regulation on hallmarking was not in force in the British Colonies, immigrated silversmiths were use to mark the silverware with their trade mark and a series of pseudo-hallmarks similar to those used in England and Scotland for sterling silver. 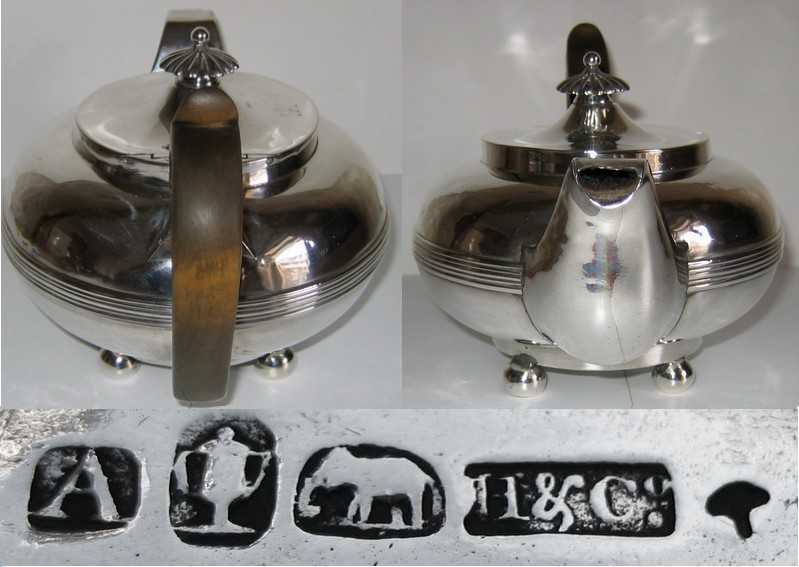 Marks, struck in line underneath the teapot are: H & Co (trade mark of Hamilton & Company); a urn, an elephant, a roman capital A and a little tailed sphere. 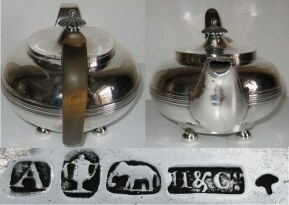 These particular hallmarks were in use between 1812 and 1820. 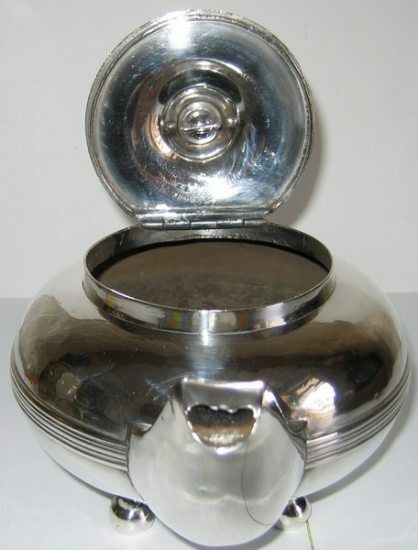 The particular silver and zinc alloy, usually just below the sterling standard (916 ppt), gives to the piece a greyer colour than that of the sterling silver obtained by a silver and copper alloy. The teapot is of very good gauge and mainly hand made with the sewing technique, with some parts (finial, feet and pedestal) obtained by casting. To increase consistency a moulded wire like girdles has been moulded and soldered all around the body of the pot. This part was also used as conjunction at the upper and down hemispheres constituting the body. Plane and elegant style, typical of the contemporary pots made in the UK at the beginning of XIX century, including the bowl feet. The handle is made of fruit wood. There is a family crest engraved on the lid. It seems that the main ain in crafting this peace was its function as teapot rather than any other consideration about style and decoration. It has some very functional details like the ring on the thumbscrew holding the finial, for hanging a tea strainer. The condition is good with some little dent and ding and a little repair of the spout.